So I finally landed the Big Kahuna Burger of collections this weekend, paying $14K for a collection that looks like it will end up being worth north of $30K. I’m going to be turning the handling of this collection into a new mid-term article series, providing transparency into the world of collection flipping, so keep an eye out for that on Friday this week. As such, for the first time in a long while, I didn’t purchase any singles this week, opting out entirely from the very tasty Origins pre-order opportunities to focus on the collection. I’ll be covering off potentially undervalued cards from the new set on Wednesday this week in the latest installment of Digging for Dollars. Just a few odds and ends I moved through Pucatrade this week. All those below were acquired at GP Singapore. 2x Wurmcoil Engine (Prerelease promo) at $11/per: I bought it from a friend, hence the exceptionally low price. Vendors were selling it at around this price too at the Grand Prix. These are Wurmcoils 2 and 3 for my RG Tron. 2x Painter’s Servant at $10/per: In my previous weekly purchases update (http://blog.mtgprice.com/2015/06/22/mtgfinance-what-were-buyingselling-this-week-june-2115/), I mentioned that I acquired a Painter’s Servant to try out it’s synergy with Ugin, the Spirit Dragon in this funky Tron build that surfaced in Tokyo a while back: http://www.mtgtop8.com/event?e=9272&d=253286&f=MO. I bought 2 more Painter’s Servants at the GP to tinker around with the ‘combo’. It’s a purely casual win-more synergy and under no circumstances should be brought to a competitive event. It’s helluva fun though. I may try and integrate the Ugin-Painter’s Servant combo into my EDH decks because I am a fun guy to play with. 2x Karn Liberated (MMA2015) at $33/per: I got these slightly lower than the fair trade price from a vendor due to plain luck, something I rarely attribute good deals to but in this case, it probably was a stroke of luck. Most of the vendors at the GP kept their displayed cards in perfect fit sleeves and marked the price of individual cards on the perfect fit sleeve using marker pen. The vendor I approached dug up the second copy of Karn from their box, which was why it wasn’t in a perfect fit sleeve. She then proceeded to scribble a ’49SGD’ on the back of Karn Liberated himself, before realising that the second copy of Karn was unsleeved. It turned out that it was their last copy of Karn as well. So she agreed to give me a bit of a discount on the total purchase (the original price of the Karns were $36 each) and gave me on of the foils in my purchase for free (foil Conspiracy Silent Arbiter). 1x Foil Unburial Rites (Japanese) at $6/per: I‘ve read multiple accounts that UW Gifts Tron is an extremely fun deck to play, so I gave it a shot while testing for GP Singapore as I was lacking the expensive components of RG Tron. They were not exaggerating at all. While the deck is not exactly tier one, the deck was immensely satisfying to pilot. There is an incredible number of permutations of Gifts pile you could play around with and the deck could attack from a multitude of angles. I’ve decided to keep Gifts Tron as a permanent deck in my Modern repertoire and so I’ve begun the arduous quest of foiling it out. 1x Iona, Shield of Emeria at $10/per: For my Gifts Tron. I didn’t have an Iona as she was quite pricey prior to her Modern Masters 2015 reprint and I was replacing her with Sundering Titan, which was not as good as I thought it would be. GPs are good place to get deals from vendors as the $10 Iona testified. 1x Emrakul, the Aeons Torn (Prerelease Promo) at $28/per: Another piece of RG Tron sorted out. Now to wait for a Grove of the Burnwillows reprint and I’ll be able to RG Tron-stomp my opponents. In the mean time I’ll experiment with the Mono-G Tron that showed up in a Modern daily a while back. 19x Snow-Covered Mountains, 3x Snow-Covered Swamps, 1x Snow-Covered Forest at $0.74 per: Another acquisition for a Modern archetype I’ve been itching to try: Skred Red. Modern cards are not easy to find in Malaysia, and could be quite expensive. GP Singapore was a great opportunity for me to grab the Modern cards I need to complete certain decks. The Snow-Covered Swamps and Forest were for EDH. 1x Snow-Covered Island @ $1.48 per: Another missing piece for Gifts Tron, for those rare situations where I am so desperate for a second blue source I Gifts up a Snow-Covered Island. 2x Magus of the Tabernacle at $0.37/per: From reader and fellow mtgfinance enthusiast Daryl (@mtgProjectZer0). Sometime ago I mentioned that I was attempting to brew a Modern incarnation of MUD. One of the version I toyed with splashed white for Ghostly Prison and Ethersworn Canonist. 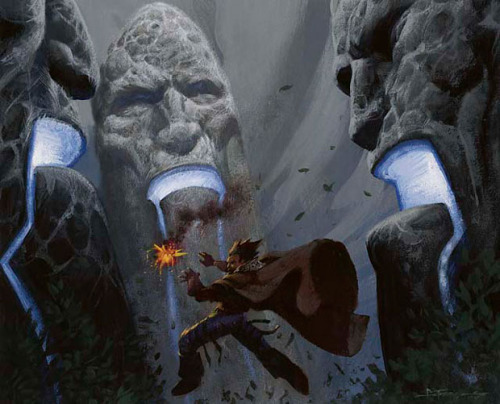 Taking a bit of inspiration off a Mono-White Stax deck posted here http://puremtgo.com/articles/mono-white-stax-legacy-modern a while back, I thought Magus of the Tabernacle may be a good addition. Thanks Daryl! Good luck with your $14K collection. That’s an insane amount considering I have to convince my wife that speculating is actually making me money. Anyway, here’s my list. These are my 3 long-term specs from M14 and I got lucky with the Mutavaults. 2 days later they went up to $14 after the purchase. This was my 1st sell since I got into speculating a few months ago and I can’t lie, it feels pretty damn good. Great sale, but how much do you net off of selling those cards? I only ask because I recently rode the hyper of Gilt-Leaf Palace before the spike and sold into the spike. Bought 20 @ 2.66 and sold them all for an average of 8.55. However, in the end after fees and initialy cost of the card plus postage I only made 100 net. Makes me wonder if its worth spec’ing into low value rares that go from 1 dollar to 5-6. I buy listed them for about$165 net subtracting 5 bucks for shipping. I know buy listing sometimes feels like your not getting as much profit but I was very happy with a 240% profit. Let’s say I sold them as playsets on ebay for $32 each. Shipping to 10 people and getting whacked with a fee for each purchase would make it work out to $6 a card anyways. Always try to keep yourself updated with different vendor’s buylists. Now, do I think your 100 net was worth it? Hell yes!!! That’s still a 200% profit even though you might feel you could of gotten a better return. Jusy a quick heads up. Painters servant is banned in edh. I still run it in a non degenerate reaper king deck, but make sure your group allows it.